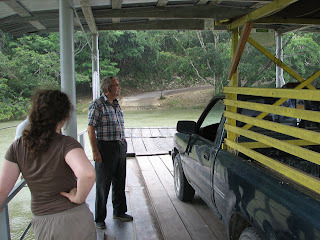 After the zoo, we hopped in the back of his pickup, and enjoyed the ride across the Belizean countryside. 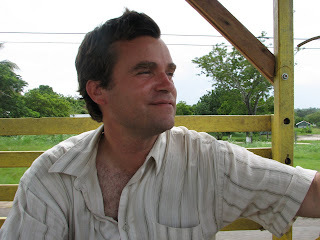 At that point, it had been over 10 hours since our last meal, but our guide was set on us waiting until we reached the market stalls in Belmopan. Belmopan is the capital of Belize after a hurricane trashed over 75% of the buildings in Belize City in the 60s. The "city" seemed like a half-hearted attempt never really believed in. The market was respectable, however. In Belize, the traditional meals consist of beans and rice. We came up to a stall with a woman sorting dried beans on a picnic table and ordered our meals. I had a long-simmered saucy beef dish, while Reb had the chicken. They were incredibly good. Afterwords, we collected a few limes, avocado, etc. at the other booths, and we were off. 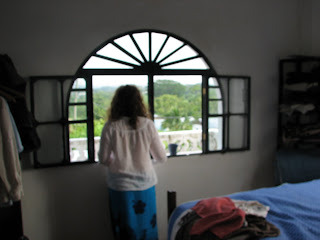 After checking out the still, dark, stuffy bunks downstairs of the hostel, our man showed us his 3rd floor rooftop apartment with windows on all sides and gentle breezes filtering through the room with great views across the countryside. We were hooked. 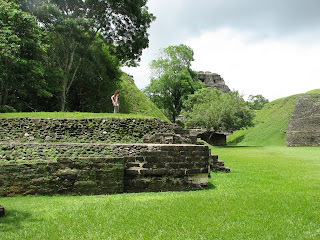 The following day, we went to Xunantunich. 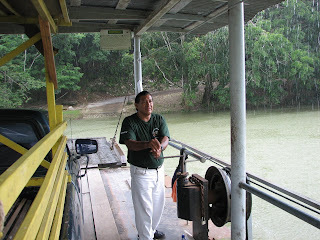 Here we are crossing the Mopan River by hand-cranked ferry. 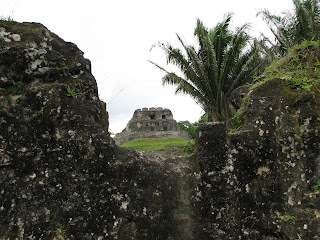 The brief gentle downpour gave way to an excellent day meandering among the 1500 year old ruins. 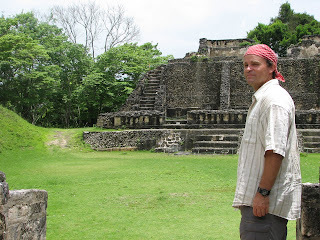 Wow--did you stay in Belize?! No new posts in almost a year. I miss them!